This was a great outdoor set for a great price. Unfortunately, we wound up moving to a place where there was no room for it, but until then, it was great! NOTE: This product is being sold as a second quality/scratch & dent item and has been priced accordingly. Chairs not included. Search for O.co catalog number 10133082 to purchase the coordinating chairs while supplies last. NOTE: This product is being sold as a second quality/scratch & dent item and has been priced accordingly. We regret that we cannot accept returns on this item. After a Verrrry long search for a quality and durable patio set, that has a defined modern apperance. We finally checked out Overstock.com. All of the highend retailers had nothing that has the simple clean lines of this table. If this wood can stand the heat of the Arizona Desert it will survive anywhere!! 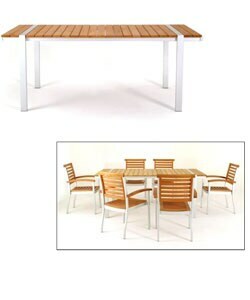 In the end we bought 8 of the Terraza chairs, 1of the Terraza 3 seat benches & the Broadbridge table. By the way. Assembly was a snap the table assembeled in about 5 min, the chairs 15 min each, and bench 30 min. Table looks great - sleak design. Was easy to assemble. First time to buy furniture online - was pleased with quality of product and promptness of delivery. Just got this, and like some others mine is damaged on top slat, the wood is very soft, not hardwood at all. We found the damaged slat only after it was constructed, which took 45 minutes. The package is very heavy, we will not send back, frankly too much trouble and will try to patch it ourselves. I am really disappointed, based on other reviews. I would not purchase this. POOR QUALITY CONTROL. 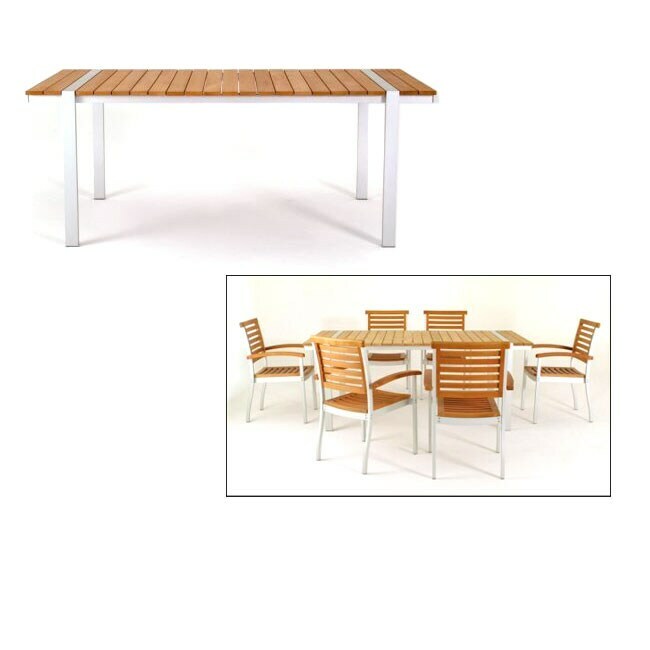 This outdoor table is good looking, very simple contemporary design. Easy to put together. It was second quality, so it had a minor dent in the top of the table but that would probably happen within 1 week anyway! It need a coat of teakoil to protect the wood. What a great price! You can't find anything that hip for that price! So I was tracking the Broadbridge table and chairs for months and thinking how perfect they were. The modern lines and clean style was what I was looking for and what I couldn't find anywhere else. I finally decided to purchase but alas the table was gone! More weeks went by and on a whim I wanted to show someone I worked with the collection and, miraculously, it appeared again! I was a little aprehensive about its "second quality" status and decided to call customer support to ask some questions. The woman was really fantastic and assured me that even though it said you could not return the item you actually could or get a refund or get replacement parts if necessary. I can't stress enough how helpful customer service was. I ordered on the 7th and it arrived on the 12th... amazing! My boyfriend and I opened the package and held our breaths... would it be damaged or missing a leg? Rock on, the table was PERFECT! It was so easy to put together, literally 20 minutes from box to deck! The chairs were also sturdy and beautiful. By the end of "So You Think You Can Dance" I had four of the six chairs assembled! I can't express enough how fabulous this set looks. Clean modern lines and sturdy construction (HEAVY!) If you get the chance buy this set. I hope you have exactly the same experience that I had. I will order from Overstock again! Regarding the scracth and dent, there were no scracthes to the metal parts, but on the top of the table two wood panels had dents and scratches about 4 inches. After sanding them and treating the spots with teak oil they are barely noticeable. The table is extremely well crafted. The appeareance is great with a very modern style. The assembly was extremely easy a total of 16 screws but you will need the help of another person to hold and lift the table when assembled. Anybody should be able to assemble it but carrying to its final location is the job of 2 people. I did it in 20 minutes. I would suggest to use a drill with an alien drill bit to speed up the proccess. I follow the suggestion of an earlier review of using teak oil prior to assembly, trust me it really brings the wood to life. I did 2 hands of oil a total of 72 hours to complete, due to the drying period. However, the waiting of 72 hours is worth every minute of it, it will protect your investment and look much better.The table is a steal at this price. I saw this table in a designer magazine first. Then when I saw it on O.co I ordered it immediately along with 6 chairs. LOVE this table; had it for 3 years now in a screened in patio area (not a sunroom, it is outside but it's totally covered and enclosed in screen). Has held up excellent but we do oil the wood every spring. Putting it together took a while (chairs especially) but it's so worth it. Awesome Table for a fraction of the designer price. I ordered the rectangular table (along with 6 chairs) and am very pleased. The Yellow Balau is great wood -- every bit as attractive and durable as teak. As soon as it arrived (which was rather quiick) I gave all the wood a coat of oil-based clear finish. I did this before I assembled the table -- even before I took the plastic wrap off the metal legs (made it much neater and the clean-up much faster). Assembly was very simple -- however, I'd suggest using your own Allen Wrench instead of the tiny one they provide. It looks far more expensive than its price and I'm confiden t it will last a long time. This table has a great contemporary look to it. I priced many other contemporary style patio furniture pieces, and the retail price was much more expensive. Table came very quickly and was easy to put together with another person. (it's very heavy). The box was in bad shape when I received it and a couple of the wood slats had come loose. I filled the holes with wood glue and re-attached. Overall great looking table and great price. They mean it when they say "second quality"
I expected a couple of scratches, but "second quality" actually meant that there were two large gashes in the top of the table. There was no description regarding what the damages actually were. Also, there should be instruction on what to finish the table and chairs with. We left it out uncovered for about a week before the finish was almost completely bleached by the sun. This table and chair set has a nice look and were easy to construct. We will be sanding the table now to make those gauges blend in, and then coating it with a uv protector. This is a great looking table and a good value. Easy to assemble and very sturdy. I'm writing this review probably 7 years after I've had the table out on my deck - year-round and uncovered. It's endured heat, cold, rain, snow, sun - everything. Still sturdy as ever - BUT (and the only reason I'm giving it 4 stars and not 5) some of the boards have warped and all of the wood has turned a dull gray. I could probably have the top sanded down to solve both of these issues, but haven't bothered to do so. It really is a solid, stylish - and now very weathered - table. One of the best deals ever!! This table is absolutely beautiful and very well made. It has a classic style with a modern look. I used teak oil to seal it and it looks great. It is also extremely sturdy and weighs about 100 lbs. Table arrived quickly. Box was a bit beat up. Table is very heavy and might require two people for assembly. Overall, assembly was easy and quck. The Table is Great, the packaging is terrible. I order this product, it arrived damaged. I sent it back, and the second one arrived damaged. Solid table. A couple of issues with the table but we bought it knowing it may have defects. In the end it worked out great once making small adjustments to the table. I wish I'd seen a first quality table for comparison. The table is heavy, which I like, and for the most part, it is holding up well. The appearance of the wood is average; a few of the boards have warped since my purchase, and I wish a spare board had been included in the packet (for just this sort of problem). Also, no umbrella hole, which I didn't think about before purchasing. Still, the total set was a great price, so I'm not unhappy. cool-looking, easy to put together. we're thrilled. saw one just like it at design within reach for 4xs the price.